Spi Energy Co Ltd (ADR) (NASDAQ: SPI) shares climbed 81.8 percent to $0.836. BioCryst Pharmaceuticals, Inc. (NASDAQ: BCRX) shares jumped 37 percent to $7.03 after the company reported additional results from a second interim analysis of its Phase 2 APeX-1 clinical trial. BioCryst disclosed that 125 mg dose Of BCX7353 showed a 73 percent reduction of overall attack rate in HAE patients. Aerie Pharmaceuticals Inc (NASDAQ: AERI) surged 31.1 percent to $53.08 as the company reported positive Roclatan Phase 3 efficacy results on Wednesday. Sears Holdings Corp (NASDAQ: SHLD) climbed 29.9 percent to $9.70 after the company posted a narrower-than-expected Q1 loss. Global Sources Ltd. (Bermuda) (NASDAQ: GSOL) shares gained 20.2 percent to $21.45 as the company disclosed that it has entered into amendment to amalgamation agreement to increase amalgamation consideration from US$18.00 per share to US$20.00 per share. Christopher & Banks Corporation (NYSE: CBK) rose 18.1 percent to $1.24 as the company posted a narrower-than-expected Q1 loss. Best Buy Co Inc (NYSE: BBY) shares climbed 17.7 percent to $59.34 after the company reported better-than-expected results for its first quarter. Guess?, Inc. (NYSE: GES) gained 15.3 percent to $11.51 after the company posted a narrower-than-expected loss for its first quarter. StealthGas Inc. (NASDAQ: GASS) shares rose 11.4 percent to $3.40 on strong results for the first quarter. MiX Telematics Ltd – ADR (NYSE: MIXT) gained 10.4 percent to $6.69. MiX Telematics reported Q4 earnings of $0.17 per share on sales of $24 million. Shoe Carnival, Inc. (NASDAQ: SCVL) rose 9.5 percent to $20.41. Shoe Carnival reported Q4 earnings of $0.48 per share on revenue of $253.4 million. MEI Pharma Inc (NASDAQ: MEIP) gained 9 percent to $1.82. Oppenheimer initiated coverage on MEI Pharma with an Outperform rating. Pure Storage Inc (NYSE: PSTG) climbed 7.7 percent to $11.64 after the company posted upbeat quarterly results. Clearside Biomedical Inc (NASDAQ: CLSD) rose 7.4 percent to $8.10. JMP Securities initiated coverage on Clearside Biomedical with a Market Outperform rating. PVH Corp (NYSE: PVH) shares gained 5.4 percent to $107.50 after the company reported upbeat earnings for its first quarter and issued a strong forecast for the second quarter. JP Morgan upgraded PVH from Neutral to Overweight. 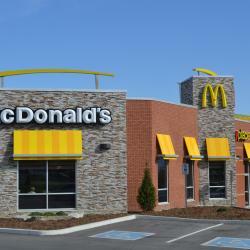 Will McDonald's Loyalty Program Fare Better Than Some Of Its Peers?